British trio Clean Bandit and Swedish singer Zara Larsson recently released their collaboration “Symphony,” a track about wanting to be a part of someone’s life. If the Toronto crowd they performed for earlier this week (April 24) was their end goal, they were welcomed into the ‘symphony’ with open arms. The pair’s current tour is in anticipation of Clean Bandit’s upcoming sophomore album and is Larsson’s first time touring on her debut album ‘So Good.’ Australian singer-songwriter Starley, who is best known for her hit single “Call on Me,” had to miss the Canadian dates of the tour due to passport and visa complications. Despite the shortened line-up, the show seemed to meet, and even surpass fans’ expectations. Larsson’s performance lived up to her album’s name. As she explained, her 45-minute set provided the perfect opportunity for fans to leave their worries behind and enjoy a night of good company and even better music. First, she threw things back to a sold-out show she did at the night’s venue, The Phoenix Concert Theatre, in 2013 with Fifth Harmony, Cher Lloyd and Jackson Guthy, calling it the “craziest show on the whole North American tour.” With such a long history in the city – and a long gap between performances – she had a lot to give this time around. Larsson effortlessly demanded everyone’s attention while knocking off hit after hit (“Lush Life,” “I Would Like,” and “Ain’t My Fault,” just to name a few), serving on-point choreography and showcasing pieces from her H&M clothing collaboration, including fierce velvet pink thigh-high boots. In the end, nothing made the crowd erupt more than her final song – the hit “Never Forget You” – as she sung both hers and MNEK’s parts beautifully. Although Clean Bandit’s set opened with some unfortunate technical difficulties that clearly frustrated the band, they recovered quickly. The electronic production trio – Grace Chatto (vocals, cello, percussion) and brothers Jack (vocals, bass, keyboard, piano) and Luke Patterson (drums, percussion) – put on an exciting 90-minute show, with help from some unsung heroes. Those heroes were Kirsten Joy and Yasmin Green, the two show-carrying vocalists that filled the void of the group’s many star collaborators like Jess Glynne (“Rather Be” and “Real Love”) and Louisa Johnson (“Tears”). When Chatto joined them at the front of the stage during songs like “Cologne” and “Heart on Fire,” the crowd went wild. Coupled with her fun and natural dance moves, you could barely tell she was fighting off a cold, which had forced her to miss some press obligations earlier in the day. Clean Bandit made things even more exciting by remixing some fan favourites for their live performance. They even threw a new unreleased song, “Should’ve Known Better,” into the set and Joy and Green said it is their favourite track to date. Tying things all together, Clean Bandit brought Larsson back on stage to perform “Symphony” and it was one big party. However, if you were searching social media after the show, surely no performance was captured more than their massive international hit “Rockabye.” The band’s label presented them with the song’s 3x platinum certification backstage before the show. Clean Bandit, Larsson and Starley wrap their current string of North American dates together on May 2 in Chicago. 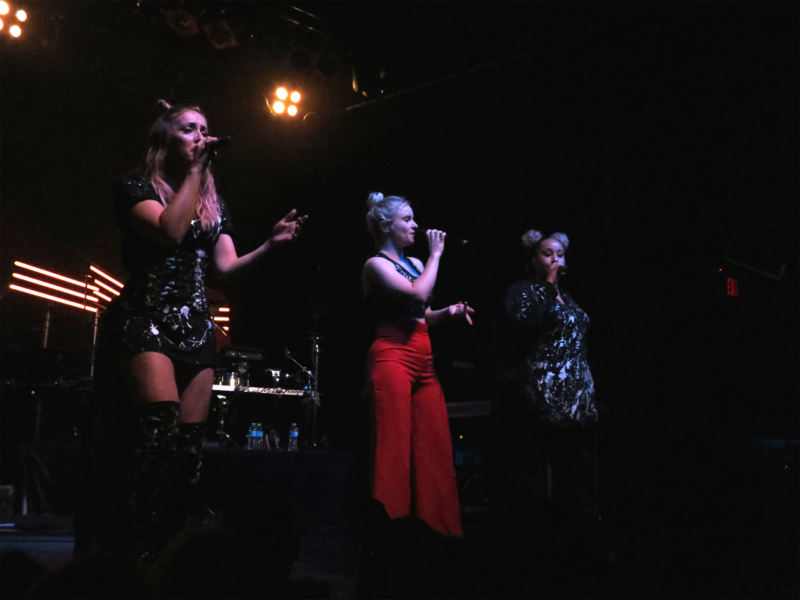 Have you had a chance to catch Clean Bandit, Zara Larsson and Starley on this tour? What was your favourite performance? Share your thoughts with us @RUtvNews.